Geoff Dyer’s funny, passionate book is written with high praise, with wonder, and with near reverence for the film Stalker, the 1979 classic from Andrei Tarkovsky. 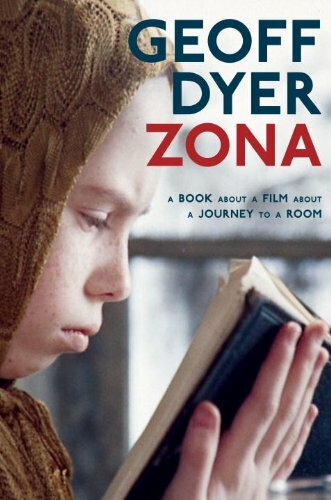 As the title tells it, the film is about a journey to a room and the book is about that film. The room is in a post-apocalyptic zone: Zona. I rented and watched the DVD of Stalker in early November. However the book was only just made available – I should have waited. There is a very telling epigraph (there are actually two) from Camus: After all, the best way of talking about what you love is to speak of it lightly. Dyer has a serious purpose, but a light touch. Why not have fun while we’re at it? An admirable approach to topics big and small. He is also very funny, and a style like his goes a long way with a book like this. Speaking of his experience watching the film L’Avventura, he writes that it’s the nearest I have ever cone to pure cinematic agony. But he’s not through with the film yet. Speaking of the sense that time drags on in Antonioni’s film at a snail’s pace, he writes that when I finally emerged into the Parisian twilight I was in my early thirties. Dyer speaks of how Tarkovsky treats the dynamic between long takes and the film goers expectation of the sense of time’s passage. There’s a particular tipping point with Tarkovsky takes that becomes an intensity of attention. He calls this Tarkovsky-time. This is contrasted to what Dyer calls moron-time, an incresing phenomena of the 21st Century. Our attention span is disappearing. Our ability to concentrate long enough to actually, say, READ is in danger. He on the other hand like men before and since, is on his way to the pub. Man, I know how he feels. I could do with a piece of that action myself. I mean, do you think that I would be spending my time summarizing the action of a film almost devoid of action – not frame by frame, perhaps, but certainly take by take – if I was capable of writing anything else? In my way I am going to the Room – following those three to the Room – to save myself. He pokes fun at himself but at the same time he’s deconstructing Tarkovsky’s film – and in a real way – all film. For all films are journeys of one sort or another. Stalker is a literal journey that is also a journey into cinematic space and – in tandem – into time. We celebrate ‘genre’ film-making: the thriller, the western, the romcom. All of these have their conventions. This makes the movie goer comfortable in selection. We know what to expect, we know what we’re in for. And the conventions are really clichés of that particular form. There are no clichés in Tarkovsky: no clichés of plot, of character, of framing, no clichés of music to underline the emotional meaning of a scene. Actually Dyer insists, toward the end of his career, Tarkovsky fell into his own clichés, but they were his and no one elses. Perhaps this is the way of art. As the artist “matures”, does he create his own clichés? His own self-references? His own caricature of himself? And why does this happen. Is he trying to be true to his “voice’? To leave a distinctive body of work? Dyer again slips into a reverie about time as he wonders about a linear time journey that seems to treat time as an aberration, as a dream state that is both anchored in real time but the real time is both finite and infinite. We never know when we’re going to die, we learn in “Solaris” [another Tarkovsky film], and because of that we are, at any one moment, immortal. Dyer speaks for the unique place that cinema has in our arts. He describes a particular landscape that is twisted and devastated. Tarkovsky makes it beautiful. Could any other medium accomplish this? Could literature? Literature can describe the beauty of a landscape and make us see it, But can literature take a devastated landscape and make us see its beauty? A good question. At least we know that in the hands of a great director this can be done to surprising effect. A word about that landscape. It was in many ways a hearkening back to a “vision of the future”. The barbed wire surrounding the Zone to keeo people in is a metaphor for the Gulag. Yet the overwhelming sense we get when watching Stalker is that this is a vision of the future – of a Chernobyl that was yet to happen (1986), or more currently – a year old, in fact – a vision of the nuclear meltdown in Japan with the exclusion zone that may not be entered, and is surrounded by a perimeter to keep people out. And then Dyer imparts another bit that certainly is fascinating to ponder. In 2001 a book was published about Chernobyl that contained many photographs of the disaster zone called Zones of Exclusion. The photographs bore a remarkable after-image of the landscape in Tarkovsky’s Stalker. Dyer posits that the photographers sense of aesthetic while assembling the Chernobyl photo-book had been somehow partially informed by the film. Could it be that the film shaped the perceived reality of Chernobyl? Beyond that, aren’t our perceptions, the way we perceive reality really a function of our prior experience, a constantly developing perception? Art funnels life (reality) through its prism and life (reality) is stealthily changed forever – until its changed forever again by another observation through the arts. Dyer’s book is divided into two parts. Part One comes to a close. Part Two starts with: Glad of the break? Of course you are. Then he goes on a wonderful rap about breaks in books (either via chapters or even double space breaks), in concerts and plays. And in films. Stalker is in two parts, and Dyer (of course) breaks his book just where the film broke. Dyer loves to play the devils advocate. At least briefly. When Writer (as a stand-in for Tarkovsky himself avers that man was put on earth for one purpose: to create works of art, images of the absolute truth. On the one hand it could be argued, Dyer says, that men were put on earth to swill beer, drop napalm on villages or build extensions to their bungaloes. Funny fellow. *There comes a point in your life when you realize that most of the significant experiences – aside from illness and death – lie in the past. **Belief clings, but faith lets go. ***Is one’s deepest desire always the same as one’s greatest regret? Dyer’s greates regret is that he’s “never had a three-wa…is that pathetic or is it wisdom? What a character! ****The thing about wisdom is that it rarely reveals itself in appearance; one never knows what it looks like in human form. *****OMG. All roads don’t lead to Rome. The all lead to Troy! A most wonderful book. This is an author I will read again.